Invertebrates, such as squid and jellyfish, play a crucial role in the marine food web and are also vital commercial fisheries. Despite their importance, little is known about their natural behaviors or how their environment influences those behaviors or physiology. In a time of changing ocean chemistry and warming temperatures, understanding the impact that environmental changes may have on these animals is more important than ever. 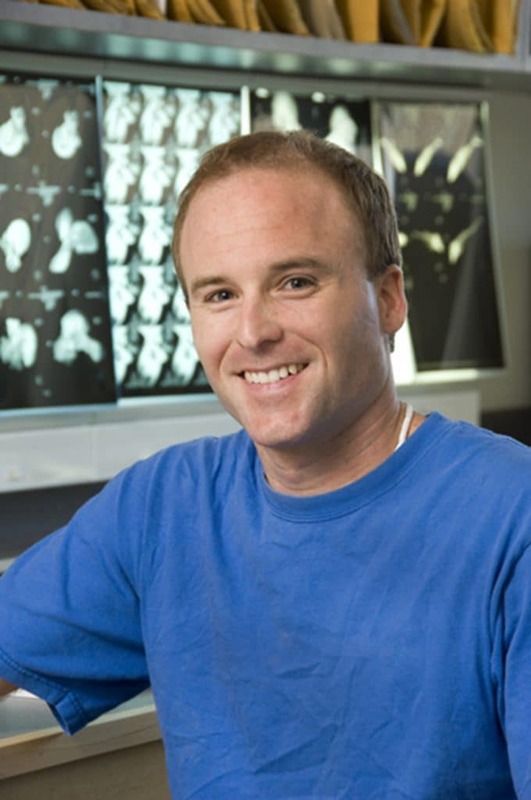 To find out, Mooney and his collaborators at Stanford University, the University of Michigan (UM), and WHOI set out to create a new kind of data-logging tag, called the ITAG, specifically for small and delicate invertebrates. This novel instrument not only quantifies ocean conditions but also measures animals’ responses to their physical environments in high resolution. 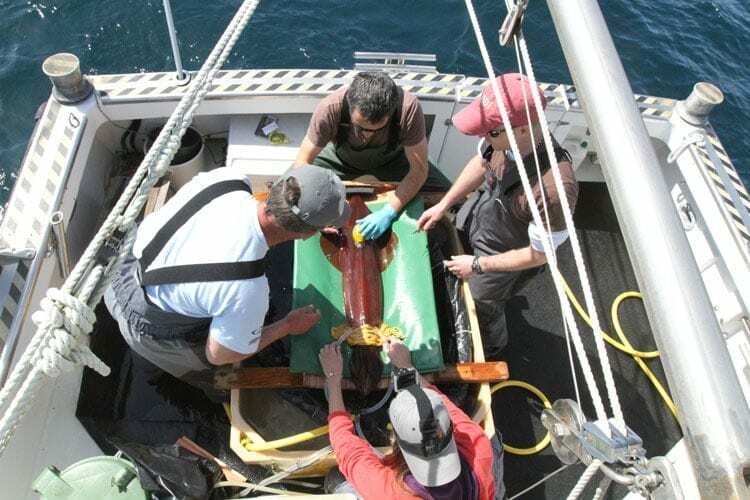 In a paper published September 28, 2015, in Animal Biotelemetry, the team reports on the results of the initial tag attachments to squid and jellyfish in the lab and the signature behavior measurements recorded. Researchers have been using digital acoustic recording tags for over a decade to reveal the hidden behaviors of large marine mammals, such as dolphins and whales. The instruments record sound while also gathering information about an animal’s pitch, speed, and depth. But the size of the tag prohibits their use on small invertebrates. Other smaller, commercially available tags have been used in the past on some larger jellyfish and squid. While the tags can track swimming depth and make other measurements, the low sampling rates do not reveal specific behaviors. “We wanted a tag that would be able to tell us what the animal is doing at that depth—is it hovering or swimming faster or slower? When squid go down to a couple hundred meters, are they foraging at night at that depth, or are they resting and getting away from top predators? What are their respiration rates? These are the types of behavior questions we wanted to answer,” Mooney said. One of the biggest challenges the team faced was to minimize the size of a tag while balancing all the other design goals—sensor capability, battery duration, and flotation, said coauthor Kakani Katija, a bioengineer who first started the work at WHOI as a Postdoctoral Scholar and completed the work at Stanford University. 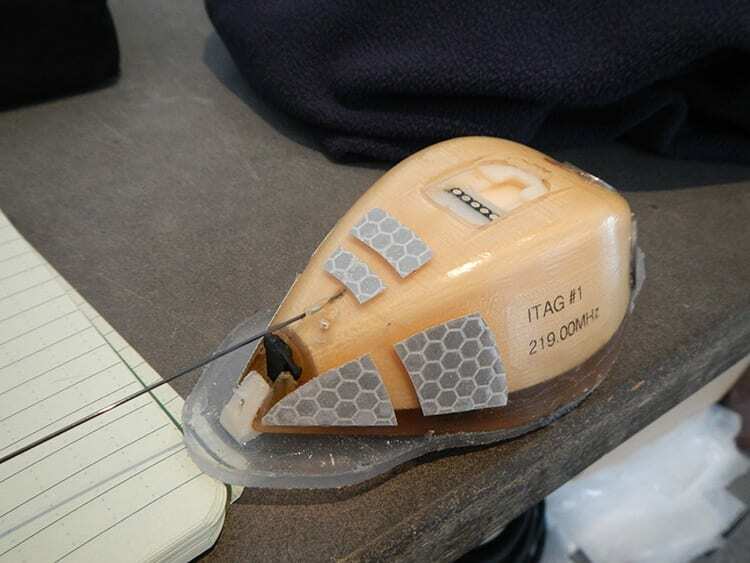 The ITAG is approximately 108 mm by 64 mm by 28 mm (~4.25 in x 2.5 in x 1 in) in size and is based on the design of the digital acoustic recording tag (DTAG) developed at WHOI in the late 1990s. It consists of two components: a sensor package that records animal movement, orientation, dive profiles and environmental data, such as light and temperature, and a base that attaches to the animal. This flexibility will allow it to be attached to a wide range of ocean animals. The ITAG is neutrally buoyant while in the water. Once the tag releases from the base, it floats to the water’s surface and transmits data via a VHF radio antenna. To reduce drag and minimize the impact the ITAG has on the animals, the researchers gave it a hydrodynamic shape keeping in mind the specific shapes, behaviors, and propulsion modes of both squid and jellyfish. In jellyfish, the ITAG attaches to the top surface of the bell via suction cups and a veterinary grade tissue adhesive. For squid, the ITAG is attached via biodegradable sutures to the back surface of the animals’ body, keeping it in line with the body to reduce drag. The ITAGs were attached to five jellyfish (Aurelia aurita) and eight squid (Loligo forbesi) in laboratory conditions for up to 24 hours. The researchers compared the responses of tagged and untagged animals to various changes in their environment, such as light conditions and temperature. The tests were filmed so that the behaviors on video could then be compared to the accelerometer data—swimming speeds, distances, swimming cycle durations and accelerations—captured by the ITAG. “Because we tagged the animals in a controlled environment, we were able to align video of the tagged animal with the recorded signals from the tag,” said coauthor Alex Shorter, a mechanical engineer at UM. The signature animal behaviors identified in the tag data will allow scientists to better interpret future tag data from free-swimming animals in the wild that can’t be directly observed, and do so at very high resolutions. The behaviors included remaining stationary or sinking, swimming in a straight line, and turning swimming for jellyfish, and finning, jetting, direction reversal and turning for squid. Lab tests of the ITAG on jellyfish were done at the Marine Biological Laboratory in Woods Hole, Mass., and the Environmental Systems Laboratory at WHOI from August through November 2013. The squid ITAG trials were conducted at the Porto Pim Aquarium with colleagues from the University of the Azores and the Marine and Environmental Sciences Centre in Portugal in Spring of 2014. Next the research team will test the ITAGs in field-based behavior studies of jellyfish and squid. This research was supported by WHOI’s Ocean Life Institute and the Innovative Technology Program, Hopkins Marine Station’s Marine Life Observatory and the National Science Foundation’s Ocean Acidification Program. WHOI biologist Aran Mooney and his collaborators created a new kind of data-logging tag, called the ITAG, specifically for small and delicate invertebrates. This novel instrument not only quantifies ocean conditions but also measures animals’ responses to their physical environments in high resolution. A new data-logging tag, called the ITAG, developed specifically for small and delicate invertebrates not only quantifies ocean conditions but also measures animals’ responses to their physical environments in high resolution.